What Is Assisted Living ? Assisted Living is independent living with a little help. Oakhill residents have private rooms and baths, with phone and television hookups. Every room is equipped with a refrigerator and microwave. You can bring your own furnishings, or we can furnish a room for you. Transportation can be provided if you need it, or use your own car. This is your home and we respect your right to choose your own activities and and set your own schedule. Oakhill has a barber/beauty shop available. We also provide a very large community room designed for those who like to visit, complete with a sixty inch television for easy viewing and listening. The comfortable "homey" feel is complemented with our beautiful cherry wood fireplace, sure to take the chill out of the air anytime of year. Oakhill is very proud of our dining room facility services. We serve three meals a day with coffee and snacks throughout the day. Our food service managers have been trained in food safety, diet, and presentation. Our staff will prepare meals paying strict attention to any special dietary needs our residents may have. Oakhill never passes up a chance for a celebration! With the large commons areas, there is plenty of room for our residents to share coffee, homemade cake, and conversation with friends and relatives. We celebrate holidays, birthdays, anniversaries, and other special occasions. We strongly encourage any reason to gather for fun and fellowship, and our kitchen is always open to support any such activities. 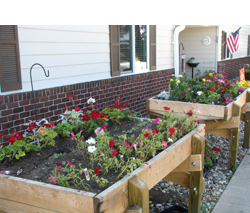 We also have new raised garden beds for our residents to show off their "green thumbs". The residents have been hard at work planting flowers and vegetables. We are all looking forward to enjoying a fresh tomato on our salad. The raised beds were built by Mr. Tom Chapman and the West Sioux High School Vo-Ag students. Great job everyone! Why Should You Consider Assisted Living? Healthcare professionals say there are clear signs for seniors to help you decide if assisted living is right for you. Oakhill Assisted Living, knows just how difficult the decision to choose assisted living can be. Our staff is committed to making this decision easier and to making the transition both simple and affordable. Your independence is important and respected, but we will be here to help you. Respite Care And Adult Daycare. Are you are recovering from an illness or injury and you're not quite ready to to take care of yourself at home? Or maybe you are a caregiver responsible for 24 hour care of a dependent relative living at home and you need time to conduct business, go to work, take a vacation, or just be free of this heavy responsibility for a day or several days. 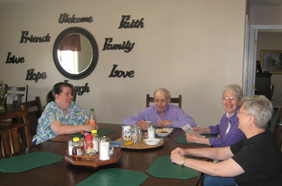 Oakhill Assisted Living can offer a place to turn to. We can provide some assistance for a few days, weeks, or as long as you wish to stay with us. -It is important to recognize that taking a break from care giving can be a positive step for both the caregiver and their loved one. Short-Term Stays are perfect when family caregivers need a short break from caring for the senior in their life, are away on a vacation or business trip. They are also an option for seniors who want the extra security of additional assistance during an illness or while recuperating. -The Adult Day Care and Respite residents are able to experience many of the benefits of Oakhill Assisted Living. This includes three well-balanced meals served daily in the dining room, as well as snacks available throughout the day. They can also join in a range of various activities. Dedicated, well-trained team members are available 24 hours a day. For those seniors requiring Respite Care, Oakhill can also provide personal assistance, which may include bathing, dressing, personal hygiene, mobility, and medication management. -Respite Care and Adult Day Care are based on space availability and the guest’s ability to meet Oakhill Assisted Living admissions criteria.